Ayyankali profile and biography is given here. Ayyankali was a social reformer par excellence. During his lifetime, he succeeded in bringing out some of the landmark reforms that changed the social fabric of the society. Through these reforms, the Dalit children were allowed to attend the school, the Dalit caste members were allowed to use the public places for transport, worship and earn money for decent living. 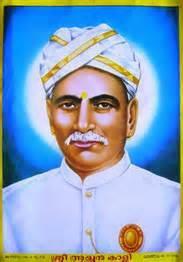 Ayyankali was a champion for the cause of Dalits in the country. These were the native Indian people who were type casted in the Indian society as untouchables. He was the first Dalit leader who strived hard to bring to bring some basic reforms for the welfare of these native people of the country. When Mahatma Gandhi visited the hometown of Ayyankali in 1937, he praised the reforms suggested by him. A statue of Ayyankali was unveiled by then Prime Minister of the country Indira Gandhi in the year 1980. At the time of the dedication of the statue, Indira Gandhi recollected the contributions given by Ayyakali for the welfare of the marginalized members of the society. Ayyankali was born in the year 1863 as one of the seven children to a couple from a Pulaiya family. His birthplace was Venganoor in Thiruvananthapuram district of Kerala. As was the custom at that point in time, he could not complete his formal education. Hence, he remained illiterate throughout his life. Like other Dalits of his time, he was not allowed to use the public roads for traveling purpose. Dalit women were not allowed to cover their breasts in public places. These strange discriminatory practices were disgusting in the eyes of this visionary leader. Hence, he tried to organize the members of his community against these discriminatory practices existing in the society. During his formative years, he was influenced by another visionary of his time by the name Thycaud Ayya Swamy who openly spoke against the meaningless caste system existing in the state. In fact, Ayyankali regarded him as his Guru and drew inspiration from him, following his teachings and footsteps. Ayyankali disliked the Manusmrithi-based Color and Caste system. Hence, he was at the forefront of the struggle against such a system. To show his open defiance against the system, he used to travel through the public roads of Venganoor on a bullock cart. Since this was against the tenets of the caste system, the members of upper castes, especially Brahmins and Nairs, were angry with him. So, they ganged up against him. However, Ayyankali could defeat the movement against him with the help of his caste members. He was dead against the banning of Dalit children in schools. Hence, he opened a school for them and taught them there. Following this cue, many other Dalit leaders also advocated for the establishment of schools for the benefit of Dalit children. During his time, Ayyankali saw the open defiance of international norms in agriculture fields of the state. This was the case when the agricultural labors were drawn from the Dalit community. They were treated like animals by the landowners or feudal chiefs. Strongly affected by these inhuman practices in the agriculture fields, he strongly advocated for the boycotting of the agricultural work by his community members. This made him the first labor leader in the country. He interacted with his community members and convinced them to boycott their work in the feudal agricultural lands. He put forward few demands to the agricultural landowners to fulfill. They were listed below. Tea shops: At tea shops, either the tea was refused for Dalit laborers or given to them in the coconut shells. Ayyankali wanted this practice stopped and tea given in small and clean cups. School Education: He wanted schools to open their gates for the entry of Dalit children. According to him, the right to the education is universally applicable to all the members of the society. Resting Time: Ayyankali openly advocated for the provision of resting time for laborers when they are at work. According to him, they are human beings, not machines. Hence, they need some resting time in the course of their day's work. Wage Reforms: He wanted the replacement of wages in-kind with the cash payment in response to the dedicated work by the Dalit laborers. During his lifetime, Ayyankali could organize a struggle for human rights of untouchables for the first time in the country. During the course of the struggle, he put forward some of the remedial measures for the betterment of these people. Many of the remedial measures suggested by him found their place in the international human rights documents well before their adoption. Much before the formation of Labor Unions in the country, he pioneered a movement for the democratization of public places and the provision for pay-for-work rule in work places. Being a dynamic leader, he could garner support not only from his community but also from other communities. An example that could be cited in this context is that of Lukka Mathai who was a Christian by faith and a landlord by profession. Under the influence of Ayyankali, he was in the forefront of the struggle for improving the living conditions of Dalits in the Kuttanadu region. The strenuous efforts by Ayyankali began to bear fruit when the roads were thrown open for the Dalit community members in 1900 and the women folks were allowed to cover their nakedness in public places in 1910. By 1914, even the Dalit children were allowed to attend school along with other children from the upper castes. Though he was an illiterate throughout his life, Ayyankali was open to the positive inputs from members of the society. He regularly interacted with them to gain the much required rapport with them. Due to this interaction, he became a formidable leader for the cause of betterment of Dalit community in the country. Seeing his leadership abilities and the work for the betterment of Dalit communities, Ayyankali was nominated to Sree Moolam Legislative Council in the year 1910. When he was a Legislative Council Member, he interacted with other members of the council to garner support for his cause. By prudently using the resources at his disposal as a Legislative Council Member, he could convince the lawmakers to bring the landmark reforms to uplift the lives of the Dalit communities in the state. Through these reforms, the Dalit community members were allowed to use the public places for transport, worship and decent living. Even children were allowed to attend the schools to brighten their prospects for the future. The principles followed by Ayyankali had a huge impact in the society. Many of the upper caste members and Christian community members openly came out in support of him. A case in point is that of Luca Mathai from Kuttanadu of the central Kerala. He organized a grand procession to honor Ayyankali and his followers in his home turf. In this grand function many upper caste members participated and recalled the services rendered by Ayyankali for improving the living conditions of lower caste members. In support of his cause, he founded an organization by the name Sadhujana Paripalana Sangham in 1905. Through the focused work of this organization, some respite was obtained for agricultural laborers. From that point in time, they had to work only for six days in a week for getting decent labor charges from feudal lords. Through his organization of agricultural labor strike, he could bring together the people working in unorganized sector under one umbrella and teach them about the need for staying united. Because of this strike, people became aware the organizational power. Ayyankali was a Dalit leader who could bring some landmark reforms in the cultural fabric of the state. He was instrumental in setting up of a pro-Dalit organization by the name Sadhujana Paripalana Sangham. Through this organization, Ayyankali openly interacted with different Dalit communities and brought them on one platform. This enabled him to bargain with the upper caste members and the lawmakers to extract some benefits for the Dalits in the state. Looking at his organizational abilities, he was nominated to Sree Moolam Legislative Council. When he was a Legislative Council Member, Ayyankali made some forceful presentations that forced the lawmakers to come out with landmark reforms in the state. These reforms changed the social fabric of the state completely. Through his interactions with other Legislative Council Members, he could generate some acceptability for his reforms.